When Vikas Khanna, ‘The Hottest Chef of America’, opens a branch of his Michelin Star awarded restaurant in Dubai, it is bound to make headlines. One of New York’s most sought after Michelin Star Indian restaurants, Junoon opened a branch in Shangri La Dubai just under a year ago, and I had the pleasure of trying out a range of their signature dishes this week. Created and conceptualized by restauranteur Rajesh Bhardwaj, the kitchen of Junoon is headed by celebrity chef Vikas Khanna was also listed under ‘Sexiest Men Alive’ by People magazine in 2011. Blessed with fine, aristocratic features, Chef Vikas Khanna could have easily made a living out of his good looks but destiny had greater things in store for him. Vikas Khanna was born with misaligned legs and could not partake in the sports young boys get up to till he was 13 (Wikipedia). Lucky for us foodies, this was the time the young chef spent time with his grandmother in the kitchen. He formed a love for cooking at a very tender age, and today stands as one of the world’s most influential chefs. I was therefore very excited about trying out Chef Khanna’s creations at Junoon Dubai. ‘Junoon’ translates to passion, craze or a deep obsession. At Junoon Dubai, the culinary masterpieces we were served are testaments to the skills of a Master Chef. The restaurant is located on the 2nd floor of Shangri La, Dubai and follows many of the aesthetics of the original branch in New York. The lighting is comfortably dim, and the interior design is a clever mix of plush, modern comfort accentuated with treasures of the subcontinent. Ornately carved wooden arches frame a privately discreet seating area, another wall features mirrored art and at the far end are beautifully pleated curtains adorning the windows that stream in outer light. The open-plan kitchen adds a contemporary look and feel to an otherwise somber, dimly lit traditional set-up. 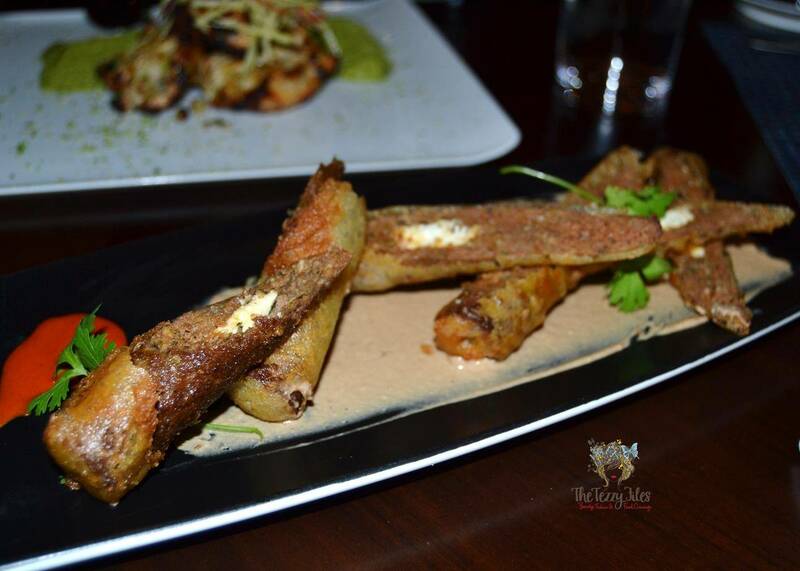 The multicultural staff further enhance the modern-day fusion that Junoon promises to deliver. Junoon’s black leather embossed menu is nothing short of chic sophistication, and sets the vibes for the up-class look and feel the restaurant has banked its image on. To start off our meal at Junoon, we were served a ‘Shuruvat’ (Hindi for ‘Beginning’). This is a clever little pop-in-the-mouth appetizer featuring plump pomegranate granules on crisp, freeze-dried mint leaves. These cold, refreshingly pungent little bites whet our appetites in anticipation for more. Pretty fancy-schmancy if you ask me! 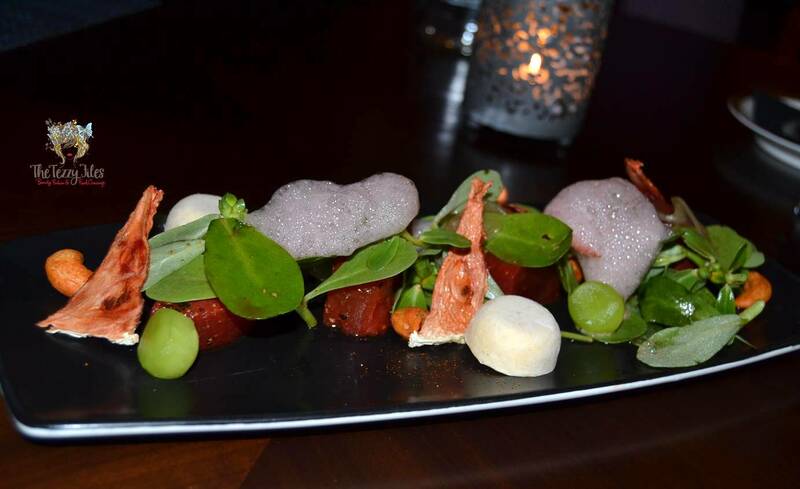 From the ‘Appetizer’ section of the menu, we tried out Junoon’s Melon Salad and Eggplant Chaat. Yes the salad includes fresh, juicy watermelon, but it also has charred, dehydrated pieces of the same fruit. The dehydrated watermelon is created in-house, and has a leathery, stretchy consistency that somehow still manages to retain the original flavors of the fruit. The white mounds are freeze-dried melon parfait buttons, and popping them in the mouth really is a chilling experience! To break away from all that melon freshness, a handful of spicy cashews have been thrown into the mix to add texture and a hit of chili. For garnish, the salad does away with the conventional sprigs of fresh mint and replaces it with a locally sourced Emirati leafy green. The salad is finished off with an aesthetically pleasing frothy, melon foam. One of the most talked-about appetizers at Junoon is their Eggplant Chaat. ‘Chaat’ is a generic name for a number of popular Indian street foods characterized by their pungently sharp contrasts of sweet and sour, and the predominating ingredient in all chaats has to be tamarind. I am a huge fan of chaat, and was intrigued to try out this unlikely combination using one of my favorite vegetables. Junoon claims this chaat is so good, that even eggplant haters will morph into converts. 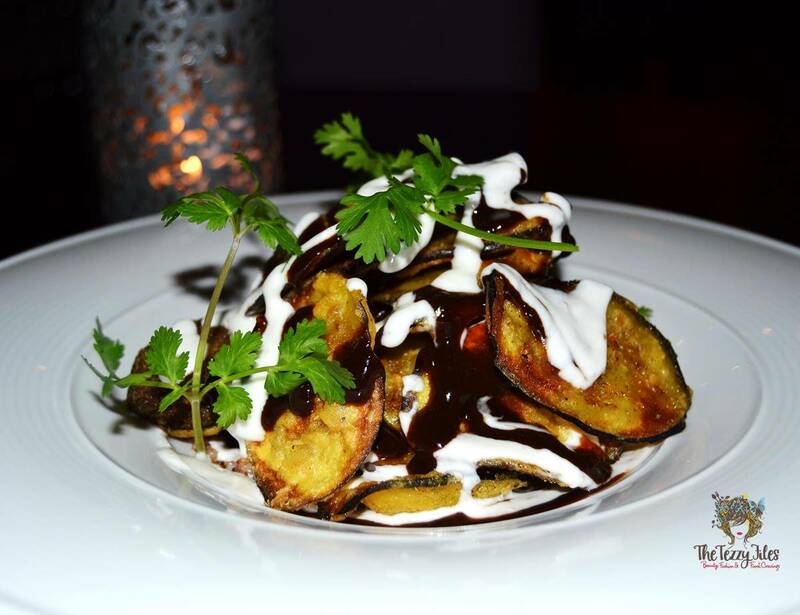 Junoon’s Eggplant Chaat is essentially an attractive-looking pile of very finely sliced, battered and deep-fried eggplant that has been drizzled with a delectable tamarind chutney and yoghurt. The pop of tamarind sourness, and the mild hit of spicy heat expected from a chaat is all there, but I wasn’t exceptionally blown away. When they say that even an eggplant hater would like this, it is totally believable as the eggplant, so finely sliced and deep-fried, tasted more like potato chips to me. As a fan of eggplant as I know it, I was expecting a magically new, fusion ‘eggplant with chaat’ combination of flavors. It’s a delicious must-try for all chaat fans, but if you really, really do like your aubergines (sorry, eggplant!) I suggest you look at other options on the menu. From the ‘Kebab’ section of the Junoon menu, we had two of the restaurant’s most popular picks: the Murg Tikka Mirza Hasnu and the Kadak Seekh. 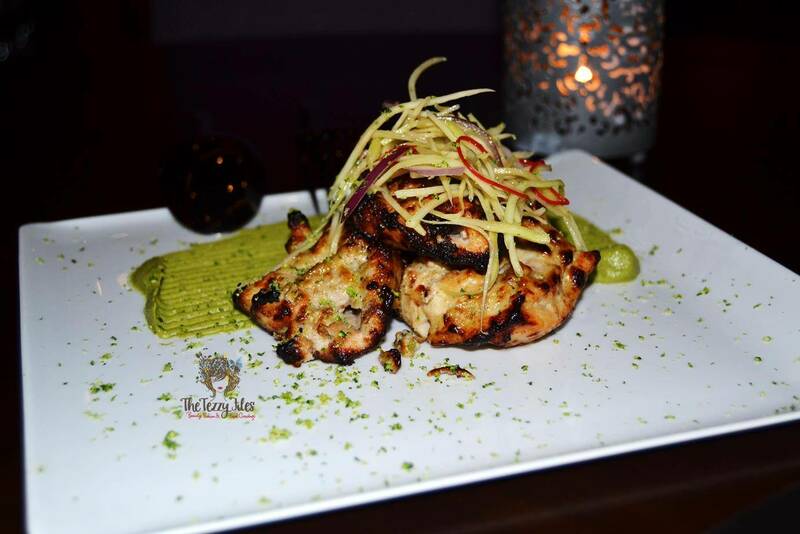 Murg Tikka Mirza Hasnu has a royal history behind it. ‘Murg’ is the Indian word for ‘chicken’, and this chicken tikka is prepared in the true palatial style of Lucknow, India’s best-loved destination for kebab fans. This kebab dish is named after culinary artisan Mirza Hasnu, who was a favourite in the noble court of Mughal Asafuttdaulah of Lucknow, and built a reputation for the royal feasts he created. The Murg Tikka Mirza Hasnu by Junoon is absolutely divine. These chargrilled beauties are succulently juicy, and melt in the mouth. You can really taste the flavorful marinade in each bite, and the taste has managed to seep in right into the meat. Adding a clever twist of his own, Chef Vikas serves the chicken pieces on a contrasting green bed of broccoli puree. The puree is rich and creamy, and beautifully compliments the flavors of the chicken tikka. I was equally impressed with our other kebab order; Junoon’s Kadak Seekh. ‘Kadak’ translates to ‘crisp’, and in this case, the humble seekh kebab as we know it has been coated in a crisp, crunchy batter that has the naughty addition of vodka as an ingredient! To further accentuate the decadence of this dish, the kebabs have been stuffed with paneer (Indian cottage cheese) that has the mild hit of green chili. The kebabs were meaty and flavorful and that play of crisp textures married with the softness of the cheese center made Junoon’s Kadak Sheekh an instant favorite on our table. 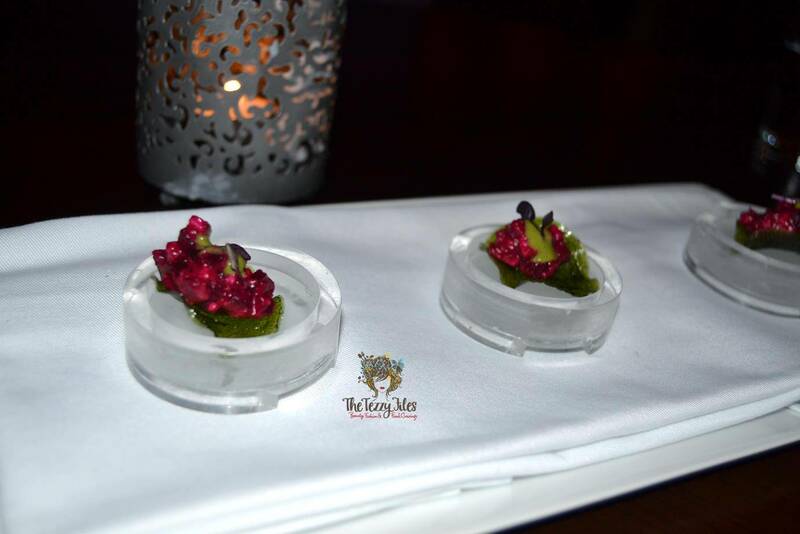 The Kadak Sheekh was served on a bed of smoked tamarind raita. I love the combination of tamarind and yoghurt, yet I’ve never tasted anything quite like this raita. It was sour and smoky, creamy yet light and I could have it all on its own with or without the kebabs! Junoon has a fully licensed bar, and a menu full of interesting, heady cocktail concoctions. 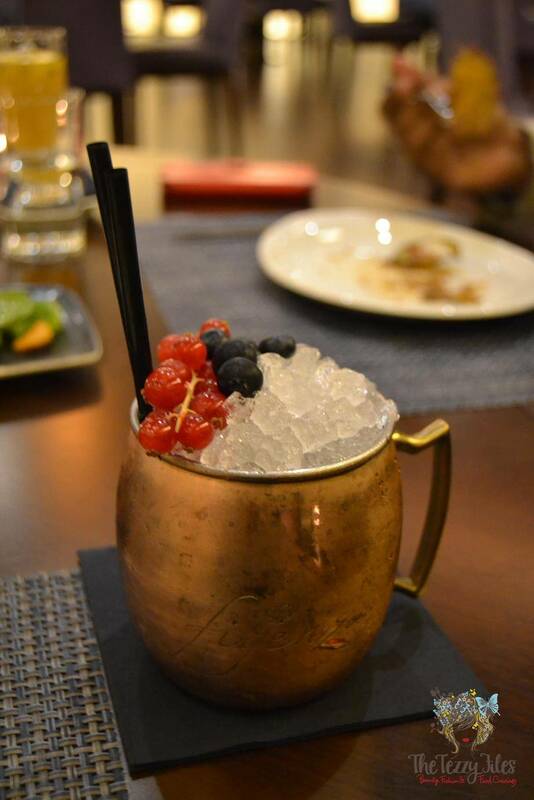 While nibbling through our appetizers, I had a mug of Junoon’s Berry Mule. I fell in love with this gorgeous copper mug as soon as it hit the table. I think copper tableware is my new obsession. Somebody tell me where I can get this mug for home-use please! This drink is a ‘berry’ infused version of the ever-popular Moscow Mule. It has the classic mix of vodka, ameretto and ginger beer with a squeeze of lemon. This version gets its berry goodness from the addition of cranberry juice and a whole muddle of fresh berries. Served over a whole mug full of ice, this is one refreshingly tart, sweet sip. My husband had a bout of the flu that night, and the staff were considerate enough to create a special brandy mix for him. 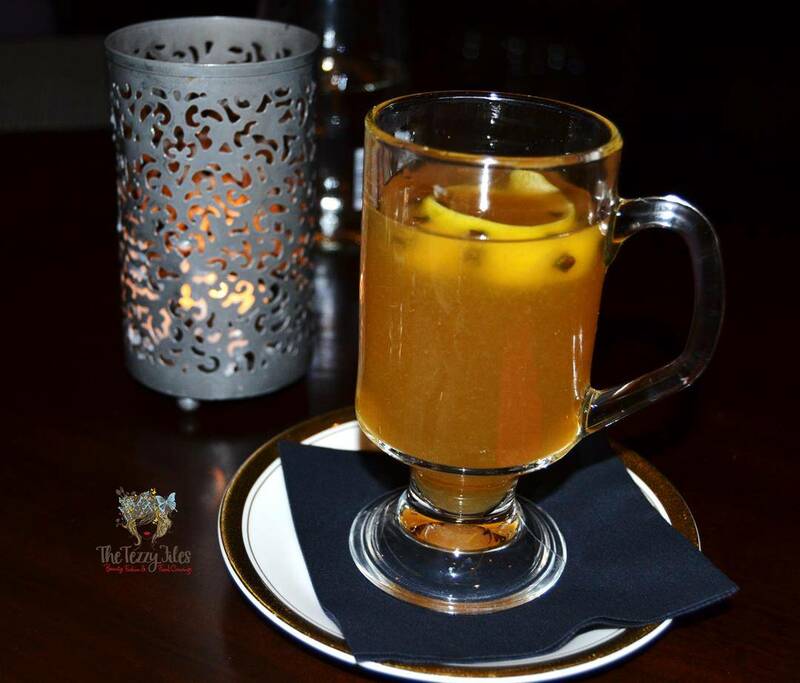 Here is his mug of warm brandy with honey, spiced up with the heat of cloves and the zestiness of lemon. Before our mains hit the table, we were served a Palette Cleanser. These cutesie tablespoon-sized servings of bitter-sweet Bitter Orange Sorbet were all at once refreshing and tangy on the tongue. 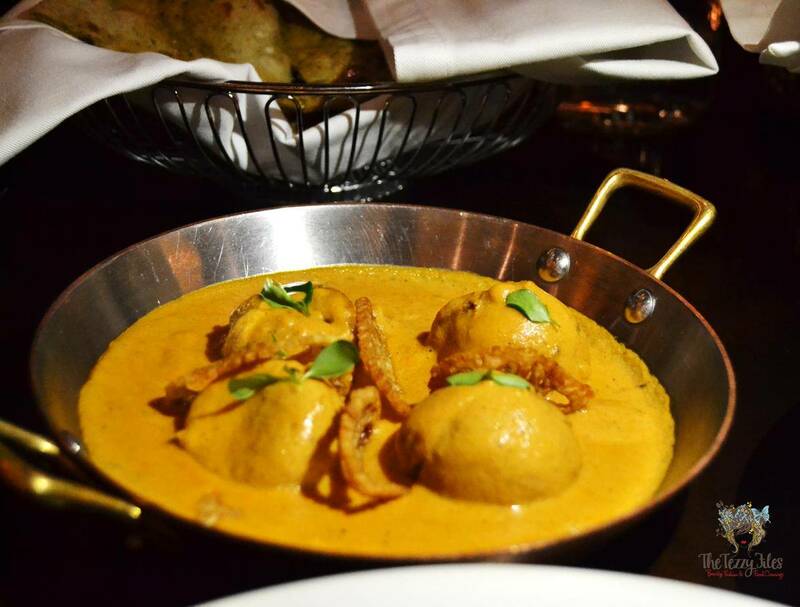 From their ‘Poultry’ section, we tried Junoon’s Chicken Chetinad Curry. This fiery South Indian favorite gets Michelin Star treatment by serving boneless, beautifully soft chicken breasts that have been ‘Sous-vided’ to retain the moisture and tenderness of the meat. Sous-vide is a French technique of sealing meat in a vacuum-tight plastic bag and slow-cooking at a regulated temperature over a water bath (yes, I watch many reruns of Master Chef!). From the ‘Vegetable’ section, we tried Junoon’s Nadru Kofta and Sepu Wadi. Nadru Kofta is a rich, exotic vegetarian dish. Ricotta cheese (paneer) dumplings stuffed with lotus root and spiced with fenugreek swim in a big copper bowl of creamy curry. The Sepu Wadi dish features logs of lentil cake spiced with ground black pepper, and is served in a flavorful tomato-yoghurt curry. My mother makes a similar dish with Bengali ties, and I have always known it as ‘Dhoker Dalna’. The Sepu Wadi took my taste-buds back home to my mother’s kitchen. Dining at an Indian restaurant, how can I not have some ‘dal makhani’ (a thick lentil gravy heavily infused with the goodness of butter)? 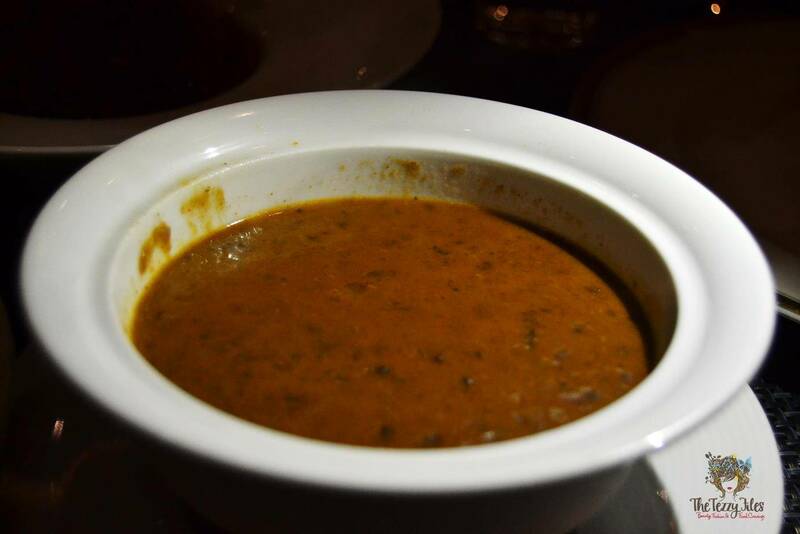 At Junoon, it got christened Junoon Black Lentil. Sometimes the most simplest, more flavorful dishes are also the least photogenic and this is definitely the case with the Junoon Black Lentil. Slow-cooked, moreish black lentils in a mildly spiced tomato base gets lashings of butter and cream and sprinkled with fenugreek. Need I say more? We scooped up all these gorgeous gravies with three very different types of Junoon breads. We had the Palak Besan Roti (a wheat flour pan-grilled bread stuffed with spinach and coriander), we had the Bajra Roti (made of the very healthful pearl millet, and stuffed with coriander seed, potato, chili and ginger), and we also had the Junoon Spiced Naan (yeast-risen bread topped with paneer and gruyere cheese, and sprinkled with zaater). One point to note is that the portion sizes at Junoon are generously large, and one dish is sufficiently enough for two. Needless to say, we had far more than we could handle on our table! By the time we were done with our mains, my husband was already ready to get up and head home. We were so stuffed! But I was not going anywhere till I had a taste of the Junoon desserts! With their desserts selections, Junoon really pulls out all the guns with their creative flair, and their presentation is simply phenomenal. I am a huge fan of falooda, the Indian subcontinent’s favorite take on a Western sundae. What genius to serve it on a platter! 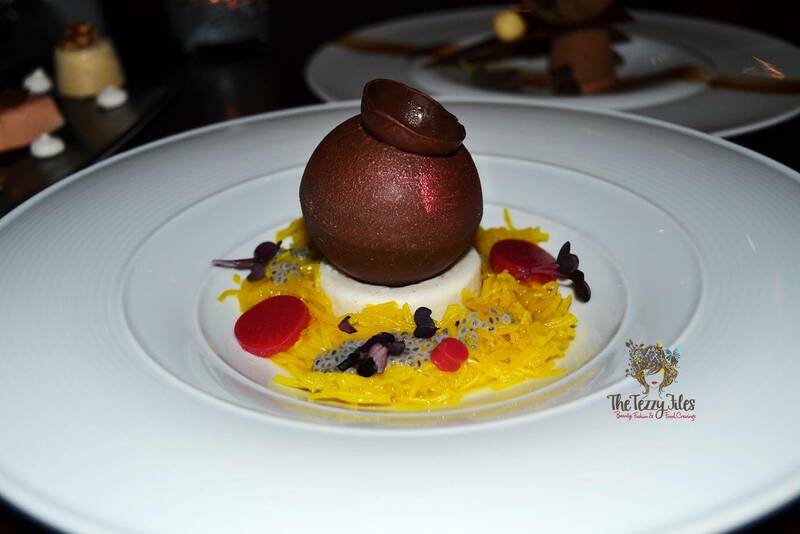 Junoon’s Falooda features a chocolate matka (a replica of the humble earthen Indian pot). Upon striking the matka, a deliciously rich, creamy rose-flavored rabri oozes out onto the saffron vermicelli. 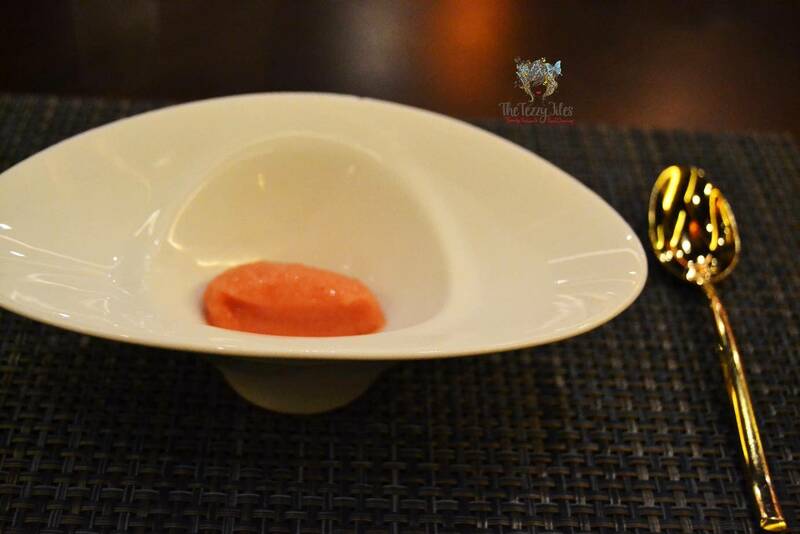 Instead of traditional kulfi, the falooda at Junoon is served with an alomond milk sorbet and to showcase master chef panache, the dish is garnish with the most delectable discs of redcurrent jelly. The other artistic dessert on our table was Junoon’s Chocolate Coconut. Doesn’t that look like a coconut half? It even has a puddle of coconut water in the center! It is infact a bowl made of chocolate, and filled with the most delicious tasting, exotic mousse I’ve had till date! This is a coconut mousse, and it has been given an Indian accent with the addition of fennel. It playfully balances on a dark chocolate ledge that has a little ball of basil-flavored barfi perched on the side. Beneath it all is an absolutely divine milk chocolat parfait that gets an Indian touch with the addition of exotic, aromatic sandalwood. Although Junoon’s Falooda is by far their most popular dessert, I would have to say I enjoyed the Chocolate Coconut even more. Try them both for yourself and tell me which team you’re on! On the far left is the Salted Peanut Kulfi. It has a full-on peanut aftertaste, and I love the play of salty with sweet. The Cardamom Kulfi is a traditional kulfi we know and love and the Junoon variation is beautifully rich and creamy. By far, my favorite was the one in the center, the Pink Guava Kulfi. Loaded with fruity goodness, it you can really get a taste of exotic pink guava with every spoonful. 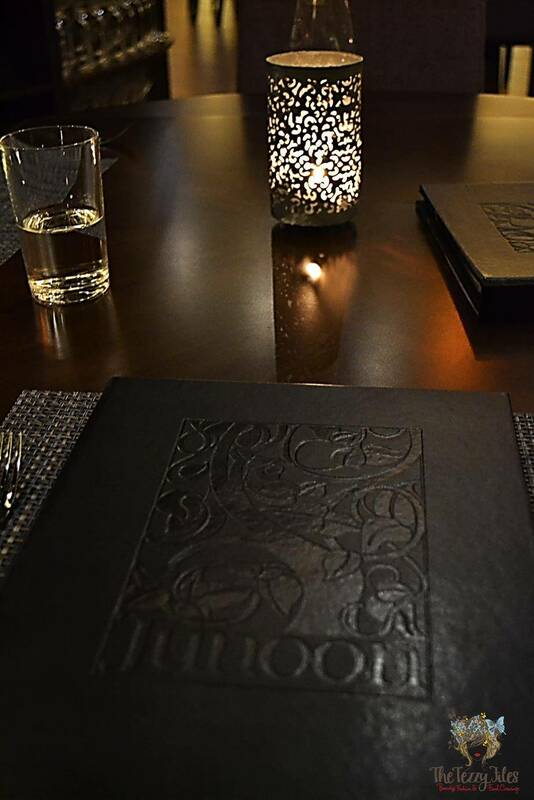 Dining at Junoon is an experience in itself. The suave ambiance coupled with first-class customer service, and knowledgeable staff who not only know the menu but even the makings of the dishes by heart, makes it well worthy of Michelin Star status. The dishes are divine, and what is more impressive is the fact that although Chef Vikas Khanna successfully serves up fusion Indian in fine dining finery, he manages to stick to the traditions of his Indian roots. The only downside is the hefty price tag, but do consider Junoon for a very special date night out. 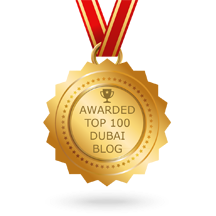 Junoon is located on the second floor of Shangri La (Sheikh Zayed Road, Dubai). For bookings and more information, call 04 405 2717. Posted in Restaurants and tagged Celebrity Chef, Chef Vikas Khanna, dubai, food, indian restaurant, Junoon, michelin star, restaurant, UAE. Bookmark the permalink.